The graves of Moses Alsbacher and his descendants. Moses Alsbacher, who led "the Alsbacher Party" of Jews from Unsleben Bavaria to Cleveland in 1839 and brought with him the ethical testament known as the Alsbacher Document, had four children and nine grandchildren. His family had burial rights at Willet Street Cemetery on the near west side and also, after 1887, in Mayfield Cemetery in Cleveland Heights. The graves of only son Isaac Alsbacher, his wife and their six children, none married, who lived their lives together in a house on Woodland Avenue. Sara was the first child of daughter Matilda Alsbacher Rukeyser and the first grandchild of Moses Alsbacher. Purchased by two of his daughters: Hannah Alsbacher Nathan and Matilda Alsbacher Rukeyser. In 1905 the three graves at Willet Street Cemetery (daughter Julia/Jetta is there too), were moved to Mayfield Cemetery and are very hard to find. Above: the graves of Moses Alsbacher's only son Isaac, his wife Rebecca and their six children. As none of the four grandsons named "Alsbacher" married, the name ended with their passing. Below, inscriptions on the eight headstones. This table does not show full dates of birth and death. Matilda Rukeyser, youngest child of Moses and Yetta, is the key figure in this tale. In 1883, a young widow in Milwaukee, she returns to Cleveland with Sara (6), Minnie (3) and Moses Rukeyser (1). They live with her widowed mother Yetta (father Moses had died in 1874) and sister Julia on Woodland Avenue, near the meat dealership and her brother Isaac and his family. In 1889 Julia, the oldest Alsbacher child, brought here as an infant, dies. This is followed in 1892 by the death of mother Yetta. The Willet Street Cemetery on the west side holds the graves of the three Alsbachers. In 1904 we find Matilda and her son Moses living in an apartment near East 55th Street. Her sister Hannah Nathan (now 59) and husband Nathan Nathan (age 77) have left Saginaw Michigan and moved to Cleveland. In January 1904 tragedy strikes: Moses Rukeyser, only 22, dies at home after a brief illness. His mother Matilda buys space for nine plots and a monument in Mayfield Cemetery, which Temple families have been using since 1887. The monument, marked "Nathan - Rukeyser", shows that the Nathans have joined in this project. A childless couple, they need only two plots. 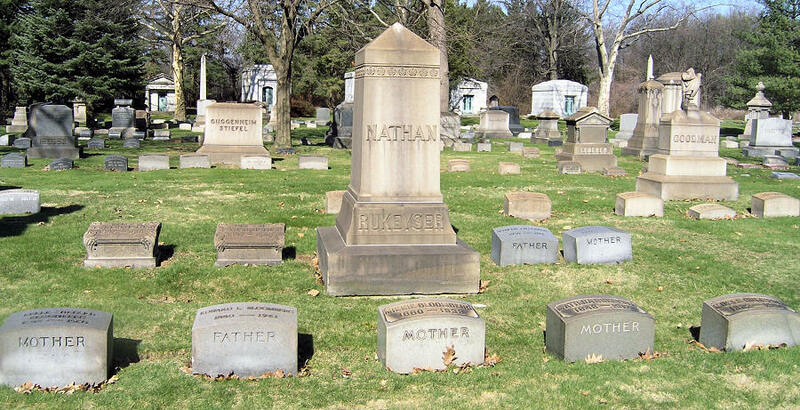 In January 1904 young Moses Rukeyser is buried in the family plot, but he lies there alone. But where are the Alsbacher graves? They are not visible in the above picture of the plot. Section 4 has no graves marked "Alsbacher". The facts, as superintendent Pat Corrigan showed me in the cemetery records, are presented below. Cemetery records show that on November 28, 1905 the coffins of Moses, Yetta and Julia Alsbacher, removed from Willet Street Cemetery, were buried here. 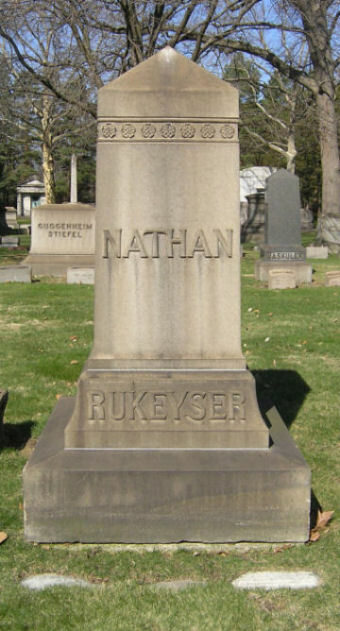 To find their graves, stand a few feet in front of the NATHAN - RUKEYSER monument. Look down. The three small stones in the ground mark the graves of (left to right) Moses Alsbacher who came here from Bavaria in 1839, his daughter Julia, and his wife Yetta. Somehow the three coffins fit in a space only slightly wider than would be needed for one coffin and its concrete burial vault that keeps the ground from settling. The space under the monument, which seems to rest on a slab, may have been used. 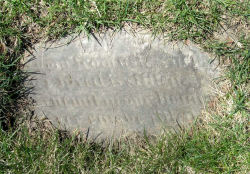 A walk around the older sections of Mayfield Cemetery finds more than a few markers brought here from Willet Street Cemetery, but none this small and unreadable. Nearly all markers are now granite because it is much more resistant to weathering than the marble, limestone and sandstone used in the 1800s. The images of the three stones below show how eroded their surfaces are, especially the marker for the grave of Moses Alsbacher, which has been wiped clean. I regret reporting that the body of pioneer settler Moses Alsbacher lies in an unmarked grave. Perhaps this page will help others find it. 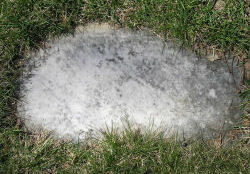 More than a century of exposure has wiped this limestone marker clean. 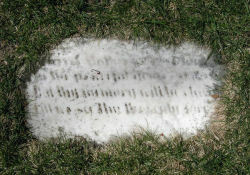 Barely legible sandstone marker for the grave of their first child. Limestone marker shows an effort to make its inscription more legible. Thanks to the Mayfield Cemetery Superintendent Pat Corrigan.